I haven't really offered session albums to my clients in a very long time. But in the past year, I have done a lot of them for children. So now I would like to officially announce a Session Album option for all clients. These would be great for families, high school seniors, little kids, couples, etc. 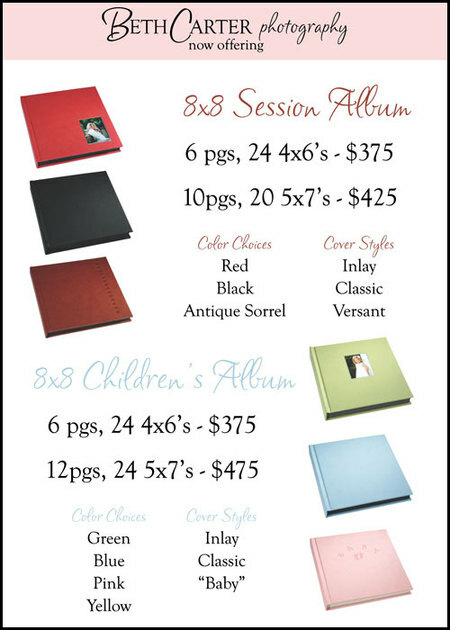 Pretty much if you love your pictures and want a great way to store and display them - this is the perfect way to do it! The albums have linen pages with mat layouts. The 6 page albums have two 4x6's on each page, and the bigger albums have one 5x7 on each page. The generic Session Albums have black pages, and the Children's Albums come with either black or white pages. Give me a call if you have any questions!